If you want to have more fun at the game nights or funny parties, GS set of 28 double six color dots ultraviolet dominoes is an excellent choice for you. 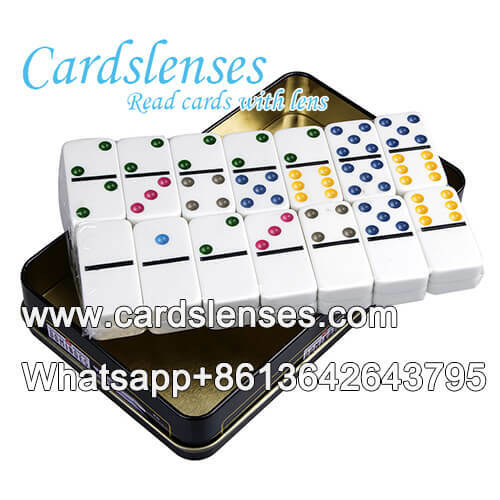 With sophisticated technology, GS technicians can use specialized ultraviolet invisible ink juice to process these quality double six color dots dominoes in perfect. The markings on the backs of double six color dots UV luminous dominoes only can be read by ultraviolet luminous invisible ink contact lenses or perspective ultraviolet sunglasses, working them together, you can know the information of all the luminous dominoes in the games and is very simple to predict the game results. -Involving two to four players for games is ideal. -Includes a set of 28 dominoes. -Ivory tile and color spots. -Markings can be customized accordance with special requirement.